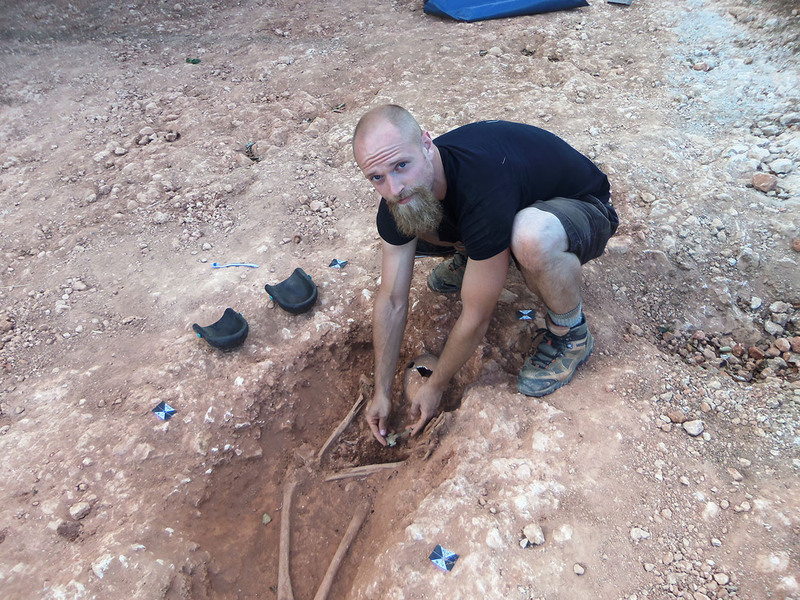 UW-Whitewater student Cameron Cudnohowski has always wanted to dig up bones. His favorite movie is “Jurassic Park.” And he loves history. When he took Professor Jennifer Thibodeaux’s class on medieval Europe, she presented him with a study-abroad opportunity to live out his archeological dream. Originally from Watertown, Wisconsin, Cudnohowski traveled to a farm in Skegness, England – about 140 miles north of London – on a dig in July 2018. Half the day was spent learning about the history of the area and its people, how to identify bones and put a skeleton together, and how to take DNA samples to determine diseases and diets. The rest of the day was spent digging. Using a toothbrush and other tools, Cudnohowski and his colleagues unearthed three bodies. Layer by layer, they removed hard clay and rock to expose the bones of a male warrior and two females. The bodies were buried with several artifacts, including a shield, urns, a beaded necklace and cross-shaped broaches made of copper. The Anglo-Saxon bodies are believed to have been placed there, near what was likely a trading post, between 500 to 550 A.D.
“It’s exhilarating because you’re thinking this person was living more than a thousand years ago. You study history in books, but this experience – literally putting the pieces of these people together and searching for their story – brings history alive,” Cudnohowski said. As he prepares for student teaching in the fall, Cudnohowski, a history education major, now has international archeology experience to draw from as he seeks to inspire the next generation.